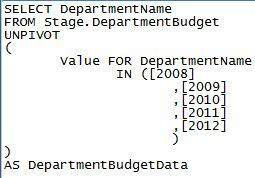 This budget data will display as an identical table and structure if no transformations are made during the import. As you can see, this is not an extensible design and it definitely doesn’t belong in a data warehouse without some alterations. As the budget years are added the ETL process will need to be changed to handle the new columns. This will also grow the table to an unmanageable size over a period of many years. This seems easy enough, but remember each column that is to be pivoted into a row must have matching data types and sizes. 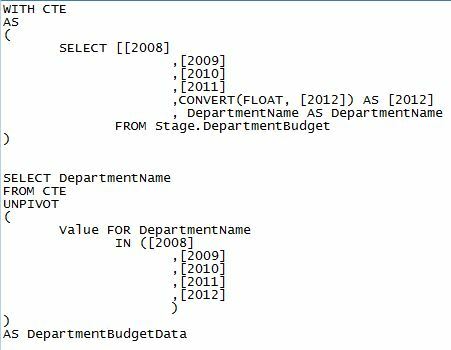 When your data types and sizes don’t match exactly you must first convert all of your columns in your select statement to have a matching data type before running the UNPIVOT function. Mismatched data types could be the result of the source data being incorrectly assigned inconsistent data types. The easiest way that I have found to accomplish this is to first use a common table expression (CTE) to convert the data and then use your CTE as the source for your selection in your UNPIVOT function. This method is easy to read and understand, so for coding clarity I like to use it. I’m sure there are multiple ways to solve this type of issue so please feel free to comment and share any other ways that you have found that work well for you. I hope this has been helpful, have a great day!